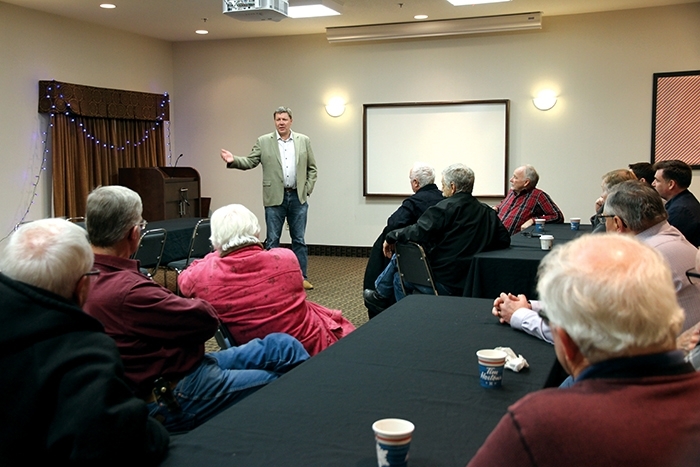 Sask Party leadership candidate Scott Moe spoke to party supporters in Moosomin Monday. Scott Moe is one of the six candidates to be the next leader of the Saskatchewan Party and the next Premier of Saskatchewan. He visited Moosomin last week, along with Moosomin MLA Steven Bonk, who has endorsed him. What made you decide to get into this race? There are a lot of things that run through your mind before you ever run for politics in the first place, and before you enter a leadership race such as this, but to make a long story short, my motivation is to really just leave things a little bit better than I found them, to improve things for the next generation, my children’s generation, in the way of opportunities for jobs, and the way of opportunities for them to have a choice, to have a career, in the community they are raised in. That is why I ran for politics in the first place, to improve that and that is why I am running in this race as well, to do what I can do to leave things a little better than I found them. How do you feel the race is going so far? It is likely not that easy to gauge, but our response has been very positive. It’s been good here this evening, and it has been good in the communities across the province. I’ve had the opportunity to visit over 100 communities over the last three months and I am reminded of what a strong presence we have here in the province. Meeting all of the people that build our communities across the province over the last three months has been one of the more personally rewarding things that I have ever been involved in, and win or lose this race, I am a winner already. What sort of things are you hearing out there? We hear a lot about the financial situation of the province, we hear a lot about some of the changes our federal government is making in the way of trying to impose a carbon tax on provinces and some federal corporate income tax changes. Ultimately where we end up with most groups is talking about what are our industries and what are our communities and what is our province going to look like at the year 2030. Over the next decade what are we going to look like at the end of the day, and we reflect some of that vision with some of the policies that we’ve put forward, most notably our growth target of 1.5 million people by the year 2030. Having a population growth target that is a credible target that is achievable of 1.5 million by 2030, and the policies that will be put into place to expand our economy, to expand our exports, to provide those careers in communities across the province, to ensure that we can hit that target and to continue to grow our communities so we can reinvest those revenues into services that people expect their provincial government to provide—services like healthcare, services such as our K-12 education and post secondary education. Brad Wall was a very popular politician in this area, a lot of people look up to him—how is the next premier going to follow up on that? It isn’t going to be easy. Brad Wall has provided great leadership to the people and the industries, not even just in the province of Saskatchewan, but for the nation of Canada at times. He has spoken very loudly and proudly and has taught us to be proud being from our community and being from this province and that is something I think we can all appreciate. As we move forward we need to ensure that we elect an individual and a team in our case with the depth to ensure that we can put the policies in place and make the decisions moving forward that allow us to continue with that growth—to grow our wealth and our economy which ultimately means the growth of jobs and growth of our communities. It’s about the policies that we can put in place and the leadership that we can provide. We will be forever grateful for the leadership that premier Wall has provided for all of us. What do you think the biggest challenge will be for the next premier? I think there is a challenge with our economy to begin with, and how we can ensure that we make decisions that provide not only the survival of our industries but have them poised and ready when some our natural resources prices do return, and some of those are starting to show signs of creeping back. Some of the other challenges that we have quite honestly are with some of the regulations and efforts that are coming out of our federal government. Things such as the carbon tax, things such as changes to the decisions around the goalposts if you will for projects that benefit Saskatchewan like the Energy East pipeline, changes with respect to corporate income tax. There are a number of challenges that are directly being imposed on Saskatchewan industry and Saskatchewan residents by our federal government, and we are going to have to be firm in some of our discussions around that situation to ensure that we do not hurt the growth of our economy and the growth of our communities into the future. What have you learned through this process so far? First and foremost I have learned how strong our communities are. They are strong because of the people in them. I have had the opportunity to meet so many of them over the last three months. That’s the greatest thing that I have learned and am reminded of and most thankful for throughout this process. What else I have learned is how quickly you can wear out a Chevy pickup truck. Are you on the road seven days a week going to communities like Moosomin? Pretty much every day. We were in Rose Valley and Porcupine Plain yesterday, Meadow Lake the day before. Pretty much seven days a week, but like I say, it has been one of the more rewarding processes that I have ever been involved with. I have a load of respect for all of the candidates who put their name forward. We are all Sask Party members first and I think the whole process is a good one for the party. I am engaging with people across this province and providing them a view of our vision as well as answering any questions that they may have. What I have learned is how strong our province is. Tha’s what I will take from this race. What is your measure of success in this race? Is it simply if you’re the next premier, that’s success, and anything else is failure? This is a little bit different than that. I think all of us as candidates in this race ultimately want, and I think we have a chance to, be successful in this and be the leader of the party and the premier, and I am no different. I am very biased, I am hoping and thinking that we have a chance in being successful, and our team does want to lead the party and lead the province. But ultimately success in this race is for us to have to really redo that whole engagement process that those eight founding members did two decades ago with the formation of this party. To re-engage at a very grassroots level with people across the province through selling memberships and conversations like we had here tonight on what does our province, what do our communities look like in the future, and renew that vision that started just two decades ago with the formation of this party. So at the end of the day what is success? Success I think is a stronger relationship between the party and the people of the province, and ultimately a stronger party.